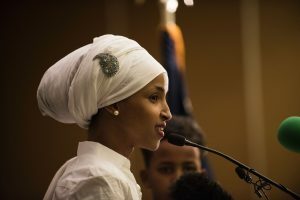 ST. PAUL, Minn. — The nation’s first elected Somali-American lawmaker says she was harassed and called “ISIS” by a taxicab driver in Washington, D.C.
Minnesota state Rep.-elect Ilhan Omar detailed the incident on her Facebook page Wednesday. She said the cab driver called her ISIS, lobbed sexist taunts and threatened to remove her hijab during a brief ride on Tuesday after a White House meeting on criminal justice reform. She did not provide information about the driver. Omar, 33, says she is troubled by growing animosity toward Muslim people. Her campaign staff did not immediately respond to a request for comment. Omar immigrated to the United States after spending part of her childhood in a Kenyan refugee camp. She won a Minnesota House seat this fall and will be sworn into office Jan. 3. Left: Ilhan Omar became the nation's first Somali-American lawmaker after winning the seat for State Representative for Minnesota's District 60B. Photo by Stephan Maturen/ARP/Getty Images.